Saitama doesn’t offer up anything new in terms of craft beer, but without much else in the area, I guess Beer Hunting Urawa can charge however much and people will pay it. I wouldn’t recommend people travel there if you’re not in the area, unless you are desperate to get to Beer Hunting Urawa to tick off another bar off your list. It’s one of the most expensive places for beers that I’ve been too, but at least it is non-smoking, has no table charge, and all prices include tax. Since Craft Beer Baby closed down in Urawa, the area around Urawa has been lacking in craft beer, with only Beer Hunting Urawa in Kita-Urawa to show for it. With a city and a popular football team, you’d have thought that more bars would be opening up in the area rather than closing down. Beer Hunting Urawa opened up in November 2015 in an area of Kita-Urawa that is in much need of craft beer. Beer Hunting Urawa is located less than a couple of minutes walk from Kita-Urawa station, on the JR Keihin Tohoku line, and can be seen from quite a way off due to it being located on the second floor with a HUGE sign above indicating the store. There is space for about 30 people inside, with around 10 seats at the counter and a few tables dotted around the bar as well. The whole place is non-smoking and there is also no table charge either. Some of the beer menus had English on them but the food menus didn’t have any English on them at all. For those wondering about WiFi, alas there is none. There are usually eight taps of craft beer on at Beer Hunting Urawa, though there is space for another two beers on the actual taps – I counted 10 on the day I went but there were only 8 beers on the menu. Beers come in three sizes – the funnily named mini (130ml) at ¥350 to ¥400, the regular (355ml) at ¥900 to ¥1,000, and the mass (1250ml) for ¥2700. Tax is included in the prices but they are some of the most expensive I’ve come across. On Monday to Thursday, there is also a four beer tasting set for ¥1300 though it can only be ordered until 21:30 if you’re sitting in the counter. 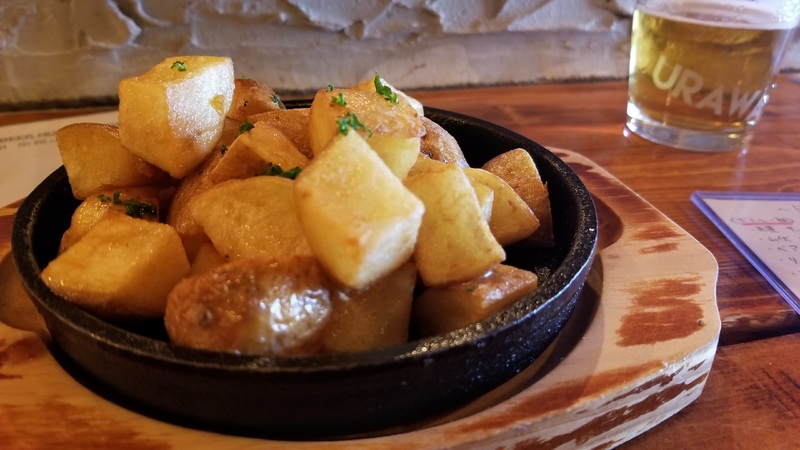 The food at Beer Hunting Urawa is fresh – as in cooked right in front of you – and also comes up incredibly hot, so if you order those fries (which turned out to be wedges) then be warned! There was some vegetarian choices on the menu but unless you can read Japanese, it’s not easy to pick out which dish is vegetarian or not. The closest station to Beer Hunting Urawa is Kita-Urawa on the Keihin-Tōhoku Line. The bar is less than a couple of minutes walk from the west exit.